Healthcare in the United States is provided by separate legal entities, often private facilities with governmental insurance for citizens. Healthcare facilities are largely owned and operated by the private sector. The United States is alone among developed nations with the notable absence of a universal healthcare system. Publicly-funded insurance is provided to the public through programs, such as Medicare, Medicaid, TRICARE, the Children’s Health Insurance Program, and the Veterans Health Administration. Active debate about healthcare reform in the United States concerns questions of a right to healthcare, access, fairness, efficiency, cost, choice, value, and quality. Many of the uninsured are the working poor or are unemployed. Although some are healthy and choose to go without it, others have been rejected by insurance companies and are considered “uninsurable”. the Children’s Health Insurance Program: The Children’s Health Insurance Program (CHIP) is a program administered by the United States Department of Health and Human Services that provides matching funds to states for health insurance to families with children. The program was designed to cover uninsured children in families with incomes that are modest but too high to qualify for Medicaid. private insurance: Private insurance refers to health insurance provided by a non-governmental organization, usually a privately owned or publicly traded corporation. TRICARE: is a health care program of the United States Department of Defense Military Health System. TRICARE provides civilian health benefits for military personnel, military retirees, and their dependents, including some members of the Reserve Component. Healthcare in the United States is provided by many separate legal entities. Healthcare facilities are largely owned and operated by the private sector. Health insurance is now primarily provided by the government in the public sector, with 60-65% of healthcare provision and spending coming from programs, such as Medicare, Medicaid, TRICARE, the Children’s Health Insurance Program, and the Veterans Health Administration. U.S. Uninsured in 2007, by income. 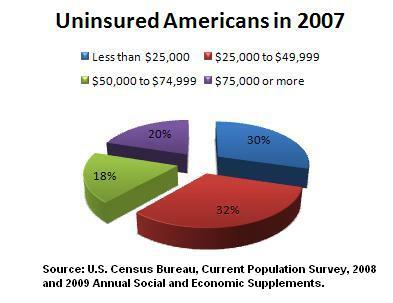 : This image shows the income distribution of Americans who did not have health insurance coverage in 2007. The data comes from the U.S. Census Bureau’s Current Population Survey in 2008 and the 2009 Annual Social and Economic Supplements–-available here (page 21). The United States is alone among developed nations with the notable absence of a universal healthcare system. 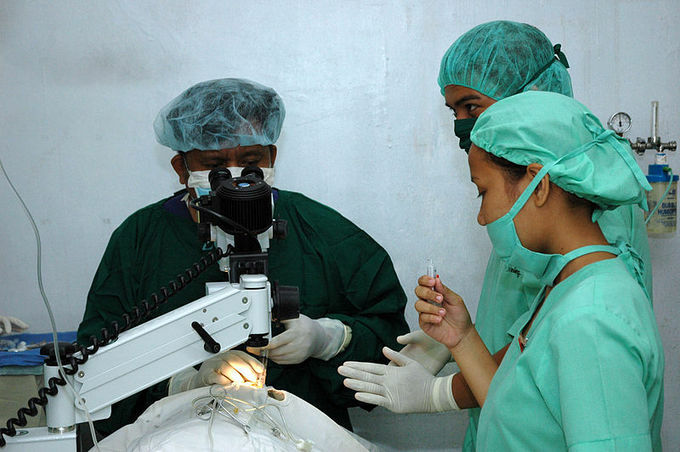 Current estimates put U.S. healthcare spending at approximately 16% of GDP, second highest to East Timor (Timor-Leste) among all United Nations member nations. The U.S. system is primarily one of private insurance, with governmental insurance provided for citizens on the healthcare fringe. Insurance is provided by large-risk bearing corporate entities, which organize healthcare delivery by negotiating pricing and services with provider (physicians and hospitals) organizations. Most Americans under age 65 (59.3%) receive their health insurance coverage through an employer (which includes both private, as well as civilian public-sector employers) under group coverage, although this percentage is declining. Active debate about healthcare reform in the United States concerns questions of a right to health care, access, fairness, efficiency, cost, choice, value, and quality. Some have argued that the system does not deliver equivalent value for the money spent. The United States pays twice as much, yet lags behind other wealthy nations in such measures as infant mortality and life expectancy. Currently, the United States has a higher infant mortality rate than most of the world’s industrialized nations. Around 84.7% of Americans have some form of health insurance; either through their employer or the employer of their spouse or parent (59.3%), purchased individually (8.9%), or provided by government programs (27.8%; there is some overlap in these figures). Alternative medicine is frequently grouped with complementary medicine or integrative medicine, which, in general, refers to the same interventions when used in conjunction with mainstream techniques, under the umbrella term complementary and alternative medicine, or CAM. Whole medical systems cut across more than one of the other groups; examples include traditional Chinese medicine, naturopathy, homeopathy, and Ayurveda. Mind-body medicine takes a holistic approach to health that explores the interconnection between the mind, body, and spirit. Biology-based practices use substances found in nature such as herbs, foods, vitamins, and other natural substances. Integrative medicine is the combination of the practices and methods of alternative/complementary medicine with conventional medicine. mind-body medicine: Mind-body medicine takes a holistic approach to health that explores the interconnection between the mind, body, and spirit. manipulative and body-based practices: Manipulative and body-based practices feature manipulation or movement of body parts, such as is done in chiropractic and osteopathic manipulation. integrative medicine: Integrative medicine is the combination of the practices and methods of alternative/complementary medicine with conventional medicine. It may include preventive medicine and patient-centered medicine. 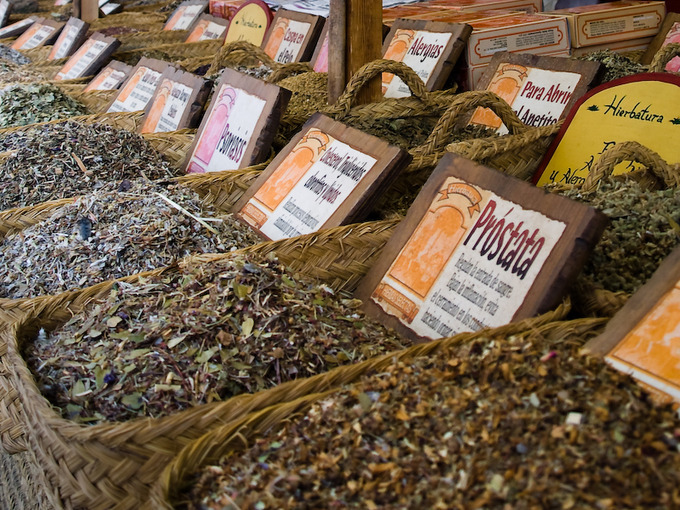 Alternative medicine methods are diverse in their foundations and methodologies, and they may be based on historical or cultural traditions, rather than on scientific evidence. Methods may incorporate or base themselves on traditional medicine, folk knowledge, spiritual beliefs, or newly conceived approaches to healing. Alternative medicine is frequently grouped with complementary medicine or integrative medicine, which, in general, refers to the same interventions when used in conjunction with mainstream techniques, under the umbrella term complementary and alternative medicine, or CAM. There is no clear and consistent definition for either alternative or complementary medicine. In Western culture, it is often defined as any healing practice “that does not fall within the realm of conventional medicine,” or “that which has not been shown consistently to be effective. ” There is a debate among medical researchers over whether any therapy may be properly classified as “alternative medicine. ” Some claim that there is only medicine that has been adequately tested and that which has not. They feel that healthcare practices should be classified based solely on scientific evidence. The U.S. National Center for Complementary and Alternative Medicine (NCCAM) has developed one of the most widely used classification systems for the branches of complementary and alternative medicine. It classifies complementary and alternative therapies into five major groups, which have some overlap. Whole medical systems cut across more than one of the other groups; examples include traditional Chinese medicine, naturopathy, homeopathy, and Ayurveda. Mind-body medicine takes a holistic approach to health that explores the interconnection between the mind, body, and spirit. Biology-based practices use substances found in nature, such as herbs, foods, vitamins, and other natural substances. Manipulative and body-based practices feature manipulation or movement of body parts, such as is done in chiropractic and osteopathic manipulation. Integrative medicine is the combination of the practices and methods of alternative/complementary medicine with conventional medicine. It may include preventive medicine and patient-centered medicine. It may also include practices not normally referred to as medicine, such as using prayer, meditation, socializing, and recreation as therapies. Its academic proponents sometimes recommend misleading patients by using known placebo treatments in order to achieve a placebo effect. Publicly funded health care is a form of healthcare financing designed to meet the cost of healthcare needs from a publicly managed fund. Most developed countries, with the exception of the United States, have partially or fully, publicly funded health systems. Publicly funded healthcare systems are usually financed in one of two ways: through taxation or via compulsory national health insurance. In compulsory insurance models, healthcare is financed from some combination of employees’ salary deductions, employers’ contributions, and possibly additional state funds. Insurance may cover other benefits, as well as health. When taxation is the primary means of financing healthcare, all eligible people receive the same level of cover regardless of their financial circumstances or risk factors. Most western industrial countries have a system of social insurance based on the principle of social solidarity covers eligible people from bearing the direct burden of most healthcare expenditure, funded by taxation during their working life. A range of measures, such as better payment methods, has improved the microeconomic incentives facing healthcare providers. social solidarity: Most western industrial countries have a system of social insurance based on the principle of social solidarity covers eligible people from bearing the direct burden of most healthcare expenditure, funded by taxation during their working life. compulsory insurance models: In compulsory insurance models, healthcare is financed from some combination of employees’ salary deductions, employers’ contributions, and possibly additional state funds. Insurance may cover other benefits as well as health. Publicly funded health care: Publicly funded healthcare is a form of healthcare financing designed to meet the cost of all or most healthcare needs from a publicly managed fund. Publicly funded health care is a form of healthcare financing designed to meet the cost of all or most healthcare needs from a publicly managed fund. The fund may be a not-for-profit trust, which pays out for health care according to common rules established by the members or by some other democratic form. In some countries, the fund is controlled directly by the government or by an agency of the government for the benefit of the entire population. This distinguishes it from other forms of private medical insurance. In the private model, the rights of access are subject to contractual obligations between an insurer and an insurance company. The latter seeks to make a profit by managing the flow of funds between funders and providers of health care services. Publicly funded healthcare systems are usually financed in one of two ways: through taxation or via compulsory national health insurance. In compulsory insurance models, healthcare is financed from some combination of employees’ salary deductions, employers’ contributions, and possibly additional state funds. Insurance may cover other benefits as well as health. When taxation is the primary means of financing healthcare, all eligible people receive the same level of cover regardless of their financial circumstances or risk factors. Most developed countries, with the exception of the United States, have partially or fully publicly funded health systems. Most western industrial countries have a system of social insurance based on the principle of social solidarity covers eligible people from bearing the direct burden of most healthcare expenditure, funded by taxation during their working life. Many OECD countries have implemented reforms to achieve policy goals of ensuring access to healthcare, improving the quality of healthcare and health outcomes, allocating an appropriate level of public sector other resources to healthcare, while at the same time ensuring that services are provided in a cost-efficient and cost-effective manner (microeconomic efficiency). A range of measures, such as better payment methods, has improved the microeconomic incentives facing providers. However, introducing improved incentives through a more competitive environment among providers and insurers has proved difficult.